HUH? 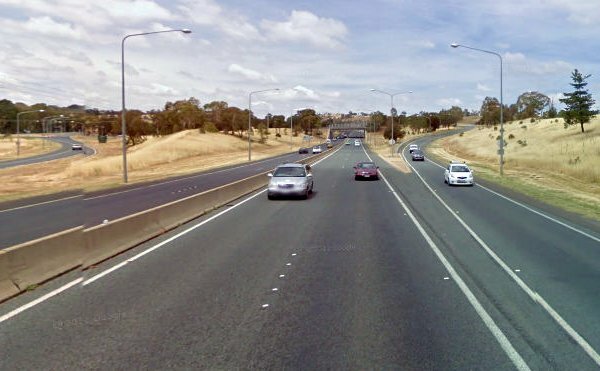 Federal budget funding for ‘Ramp metering on the Tuggeranong Parkway’. Like 99.9% of the population, I had no idea what ramp metering was, let alone why the Commonwealth would pay for it or why it was needed at the Cotter Rd/Tuggeranong Parkway interchange. So I did some digging around and found the following factsheet on the Nation Building Program website. But far from answering my questions it only added to the confusion. Who would have thought that ‘ramp metering’ (which apparently refers to traffic lights to control people entering an on-ramp) at this location, which isn’t particularly choked by traffic compared to other parts of Canberra, is such a priority from the Commonwealth perspective. And who would have thought that this was the ONLY new project funded by the Nation Building Program in the ACT in 2013-14. Other states get dozens of new projects worth tens or hundreds of millions or even over a billion dollars- we get $300,000 for a set of lights which are not really needed, and which will only act to slow traffic flows. Surely if they think merging onto the Parkway is such an issue, why not think ahead for when Molonglo comes online and just build an extra northbound lane between Cotter Rd and Glenloch interchange? So, the way I understand it is that cars entering the parkway are stopped at intervals to reduce the impact of traffic entering from the off-ramp. So, instead of having cars that enter the Parkway doing 80-90km/h with the run-off from the ramp and merge nicely, we will have cars that get stopped just short of the Parkway and when the lights go green, they have to speed up and probably end up merging with a speed of only 50-60km/h??? How does this help? When you merge into traffic, matching the speed of the other cars is of primary concern, as if you go slower the only result is traffic having to brake in the faster, main thoroughfare. I predict more traffic jams, not less. I can only speak about Melbourne, but they are all still in use there. They only come on at peak hour, and they do make getting on to busy roads like the Monash much easier. The ones there usually go from two lanes in to one lane, then you merge, so it does kind of force you in to a drag race with the other car! Same in Brisbane and Sydney. Some are on a timer, and will only operate during peak, some operate whenever traffic flow is reduced below a set speed on the motorway. I always thought it was a bigger bottleneck goung southbound to get onto Cotter Rd rather than getting off it. They need to find a way to stop people from merging into the left lane at the very last moment and slowing all right lane traffic to a halt. RPG’s would be my preferred deterrence method. A real test of the Coalition’s bona fides on APS savings will be whether they stop employing APS staff to administer federal funding for such utterly piddling (but sometimes vote-winning, when comprehensible) projects. So, when it’s operational, everyone in weston creek will just bum rush the ramp at hindmarsh drive instead. And since they never bother to change the light change schedule on the triple set of lights there, the morning commute out of weston creek will continue to be horrendous. Awesome. How about they just teach Weston Creek drivers to merge – that is, you should match the speed of the traffic you are attempting to enter. Even from Cotter Rd onto Adelaide Ave (which is only 80km/h), you almost invariably get stuck behind someone who tries to merge onto Adelaide Ave at 50-60km/h and wonders why no one will “let them in”. They need to install speed camera on those ramps, but set them so they ping anyone doing under 80 while trying to merge. It’s bloody dangerous. And another thing! For all the work going on with the traffic lights Cotter Rd/Lady Denman Drive/McCulloch St, there is absolutely no sign that the road between McCulloch St and the Parkway is going to be widened any time soon to match. They’re doing down to the bridge near the horse park in this stage, then after that is complete they’ll do the next stage down to the parkway including adding to/installing a new bridge. All part of the cunning and devious plan to have roadworks on Cotter Road for as long as humanly possible.